This is your retirement guide to New Mexico, population slightly over 2 million in 2015. Median age is 36.8. The Land of Enchantment has the altitude, scenery, and beautiful towns that have attracted many baby boomers to the many best places to retire in New Mexico. Santa Fe is the capital and Albuquerque is the largest city. New Mexico's cost of living can vary a great deal - Santa Fe tends to be much more expensive than other parts of the state. It has a rich Spanish and native American culture that adds charm and interest to the state. The Wikipedia entry for New Mexico has more interesting facts. Updated Dec. 2016. The New Mexico climate is that of the steppe, characterized by aridity and an altitude above 3000 feet. Summers are hot and dry, there is plenty of sunshine. There is a lot of snow in the mountains. New Mexico's median 2010-14 household income at $44,968 was almost $9000 below the U.S. average. New Mexico had the 23rd lowest cost of living of all the sates (MERIC).Tourism is important to the economy. According to Zillow, the statewide median home value in 2016 at $167,600 was below the national median of $189,400. The median home in the Santa Fe area was valued in 2016 at about $307,100 (Zillow). In Albuquerque the median home went for $193,800 in late 2016 (NAR). Tax Burden: At 8.7% the total tax burden in New Mexico is the 37th highest of all the states (TaxFoundation.org). Marginal Income Tax Rates: The New Mexico income tax has marginal rates from 1.7% to 4.7% (on a couple with $23,450 income). Retirement Income Exemptions: There is a modest reduction in taxes for people 65 or over with incomes less than $55,000 (couples). Military pensions might be eligible under this exemption. Social security exemption: NM is one of the few states that taxes social security payments, although the exemption discussed above might apply. Sales Tax: State sales tax is called the Gross Receipts Tax : it is 5.125%, though higher in many municipalities, so the statewide average after surcharges is 7.35%. Property Taxes: Per capita property tax paid is $685, which ranks it a tax-friendly 47th of all states. People over 65 with incomes less than $18,000 can get a small rebate on some of their property taxes. Estate and/or Inheritance Taxes: This is complicated - although estate or inheritance taxes are not likely to be significant. New Mexico does not have a certified retirement community program. New Mexico has some of the top retirement towns in the U.S.; it also has many planned retirement communities. 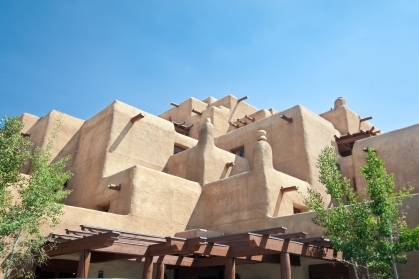 One of the best places to retire in New Mexico is the artists' commmunity of Santa Fe. Located high in the mountains, it boasts a thriving environment for the arts and outdoor activities, along with being one of the oldest cities in the Americas. Las Cruces is another charming but much less expensive option in southern New Mexico. Albuquerque has a great year round climate and attractive setting. This livable town is host to the University of New Mexico. The ski resort of Taos is another interesting retirement town in the mountains. In 2009 Topretirements published an extensive review of New Mexico retirement destinations, including pros and cons. Click on the New Mexico Retirement city and town reviews on the right.